YST Composition teaching assistant and alumnus Dr Chow Jun Yan was selected to take part in the ASEAN Youth Ensemble (AYE) Music of ASEAN – ASEAN Creation Project, organised by the Princess Galyani Vadhana Institute of Music (PGVIM, Thailand) in collaboration with the Ministry of Culture, Thailand. Held from 24 – 31 August 2018, the project aimed to create dialogues between ASEAN country traditions through music. Over the course of the project, performers and composers engaged in workshops and concerts, as part of the PGVIM International Symposium on Music and Socio-Cultural Development 2018, which explored metamorphoses in musical styles and meanings over time. Participants came from a wide range of countries, including Germany, Indonesia, the Philippines, Singapore, South Korea, Thailand and Vietnam, each bringing experience and knowledge in traditional instruments from their culture. Jun Yan playing in a workshop. The project culminated in a finale with the ASEAN Creations Concert, where seven compositions with different combinations of traditional instruments were presented. 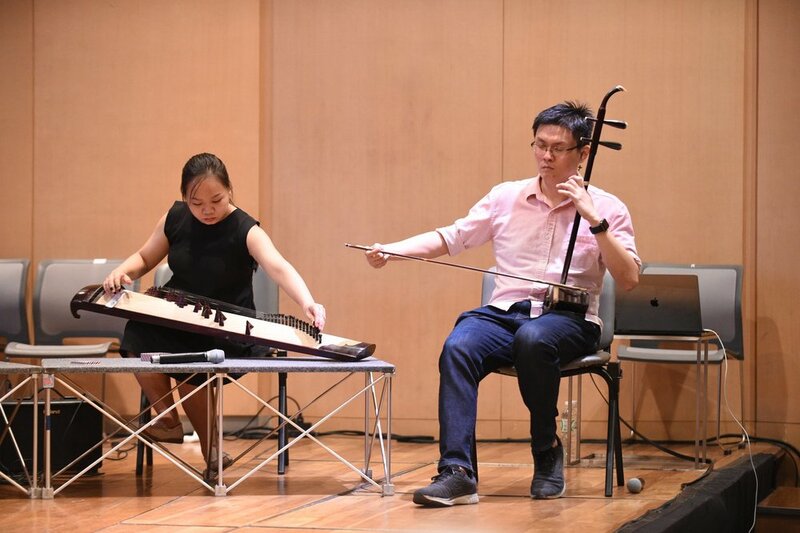 Jun Yan presented his composition for erhu, flute and percussion, titled Nostalgic Portrait, at the concert.